It's my Birthday today (I'm old) and this probably isn't what you'd picture for birthday nails but it's just what I ended up with! The base is an unnamed colour by Maybelline MNY, and I sponged some Models Own Peacock Green on the tips. When it was dry I added some Models Own Juicy Jules. 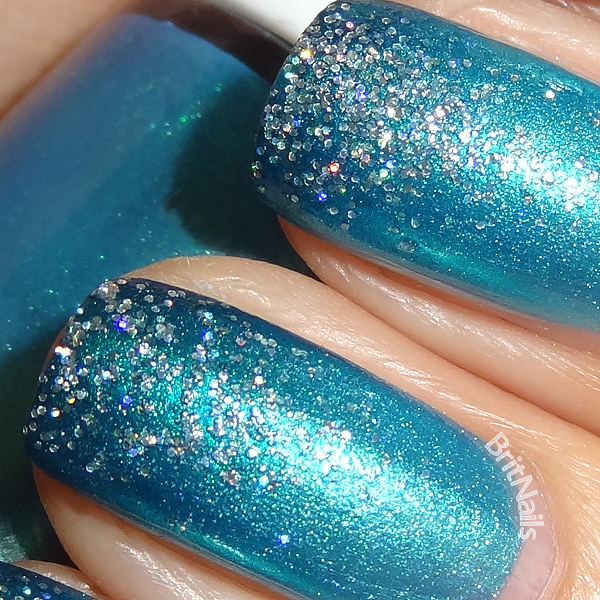 Juicy Jules is quite a gritty glitter, but the result is it ends up looking like little diamonds! What a perfect birthday nails! Happy Candle Cakes Day! Happy birthday!! What a perfect birthday mani, so sparkly and fun! Hope you have an awesome day! So pretty! And Happy Birthday!!! Happy Birthday and what a fabulous mani, very pretty! Happy birthday! I love a good gradient and holo glitter makes it even more wonderful! happy birthday!! enjoy your day :) I am loving that glitter too, i does look like diamonds! It's really pretty! Happy birthday! happy birthday! it' s gorgeous! Late happy birthday, and wow - blue-green gradient with glitter? I love it.